CLASSIC. Adapted from the novel by L.M. Montgomery. Matthew Cuthbert and his sister, Marilla, are getting older and decide to adopt a boy from an orphanage to help out on their farm, Green Gables. But when Matthew arrives at the train station, he is disappointed when he discovers that the orphanage mistakenly sent a girl instead of a boy. However, Anne Shirley, a cheerful young orphan with freckles and red hair, instantly charms Matthew, and he convinces his sister to keep Anne instead of returning her to the orphanage. 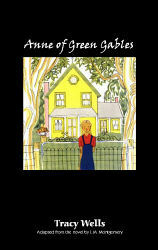 The precocious, imaginative Anne happily settles into her new life at Green Gables but manages to get into a few misadventures along the way. She dyes her hair green, jumps off the roof in a dare, and mistakenly bakes a cake with liniment instead of vanilla. Anne proves to be one of the smartest pupils at her school and earns a prestigious scholarship to attend college. But when Matthew unexpectedly dies, Anne shows her devotion to Green Gables by giving up her scholarship and staying at home to help Marilla on the farm. Audiences will love this charming, heartfelt classic.